I started out Day One of the school year with a discussion around what my sixth graders know about the oil spill in the Gulf and what has been happening in the recovery and recapping efforts over the summer months (later that same day, I found out about the explosion of another platform). I shared with one of the interactive maps online that shows the spread of the oil from May to August. I explained to them that throughout the course of the year, we will be doing inquiry projects and environmental-themed writing that centers around these issues as part of the Voices on the Gulf endeavor. My hope is to touch a wide range of issues as we move forward. I explained this to my principal the other day, and he was very excited about it, wondering how we could use Skype or videoconferencing to connect with other students, particularly those who are involved who live along the Gulf Coast region. I’m going to work on that, I told him. 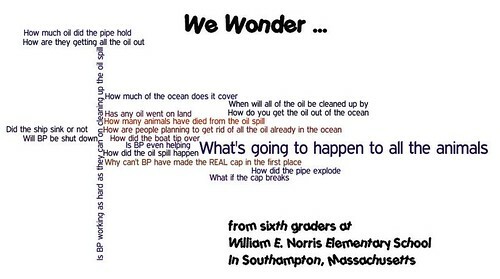 But first, I asked my homeroom class: What questions do you have about the oil spill? I took their answers and created a Wordle of the responses, which is now posted up at the Voices on the Gulf. You, and your students, are also invited to join us on this collaborative project. You can read more information about what is required (it all depends on you) and how to get started. PS — I’ll leave you with a song that I wrote during late August about my feelings around the Gulf’s recovery. I shared it at Voices on the Gulf, but I was on my blogging vacation back then. This entry was posted in Songwriting, Voices on the Gulf. Bookmark the permalink.